A beautiful arrangement of sweet smelling Freesia nestled in forest fresh greens. Freesias are a naturally long lasting flower and smell divine. Included are blue, pink, red, white and yellow freesias making this one of our most fabulous arrangements. The arrangement is suitable for all occasions and is available for UK next day delivery. 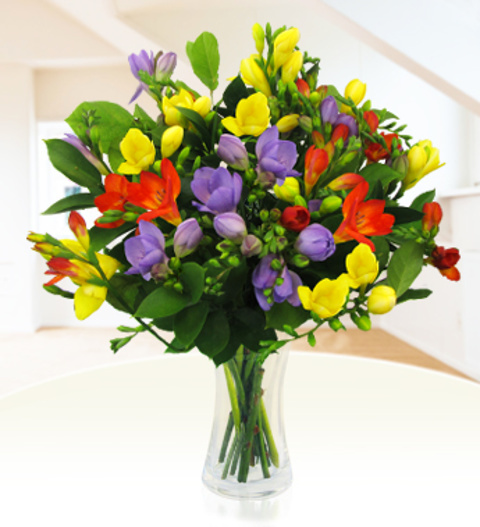 Also included with each Freesia bouquet is a FREE box of fine Chocolates and FREE vase. Please note that some Freesias may arrive in bud form to ensure the longevity of your bouquet. Chocolates may contain nuts.